If you plan on visiting the lovely castle town of Izushi, we highly recommend making your own Izushi Sara Soba. 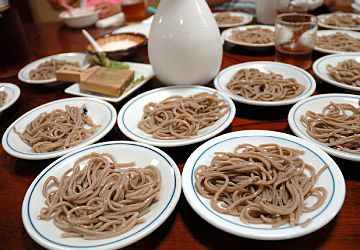 Sara Soba, or plated buckwheat noodles, is a specialty of Izushi. 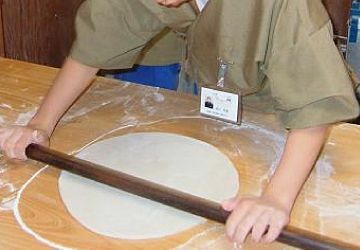 Many soba shops offer workshops where you can learn how to make soba from scratch step by step, and of course you get to enjoy your hard work at the end. For details on workshop locations, times, and prices, checkout the URL link in the “INFORMATION” section of this page. 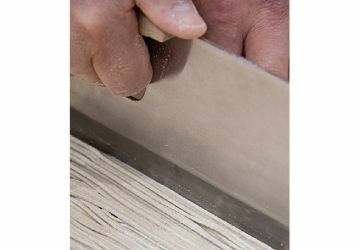 Cutting the soba. The trick is to cut them thinly and at the same width. 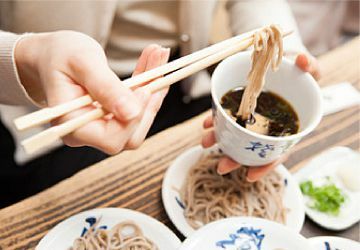 How did your soba turn out? Don't be embarrassed if it didn't turn out like the pros, it takes years and hundreds of tries to perfect the art of soba making. Now it is time to enjoy your hard work. Try the various toppings like wasabi and raw egg with your soba. Times vary for each shop, please see the link above for details. Prices vary for each shop, please see the link above for details.